Resurgent Hindu Forces are trying hard to strengthen Hindu Activism upto grass-root level in Eastern Bharat (India). 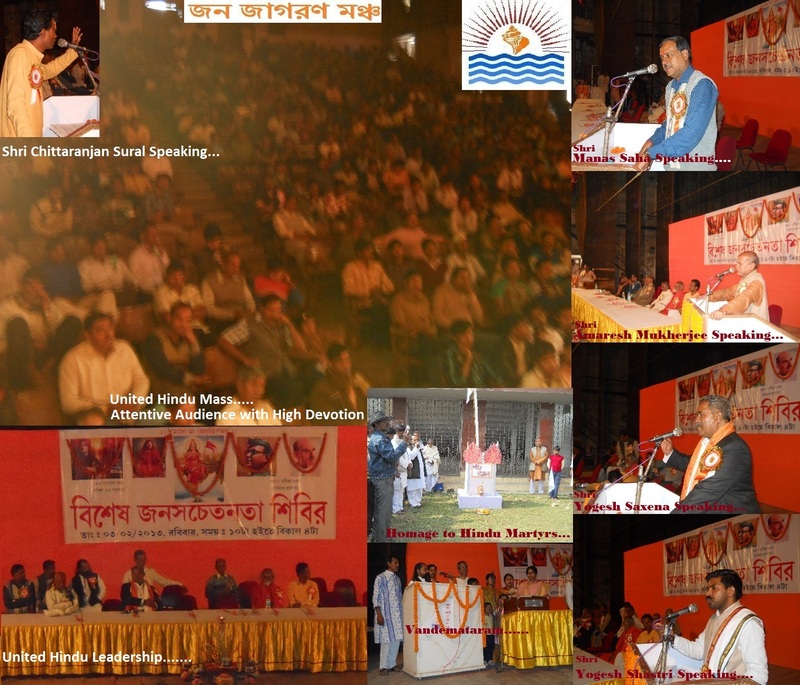 Diamond Harbour (West Bengal) and Dhanbad (Jharkhand) | Special Correspondent, Hindu Existence | 5th February, 2013:: On 3rd Feb, two vital Hindu conferences were held under the initiatives of JANA JAGARAN MANCH at Diamond Harbour, South 24 Parganas, West Bengal and TARUN HINDU DAL at Dhanbad, Jharkhand. While a 700 devout Hindu people assembled at Rabindra Bhavan of Diamond Harbour, another 1200 Hindu warriors thronged at Steel Gate, Sarai Dhela, Dhanbad. The day long programmes were successfully completed in both places with definite resolution to combat anti Hindu forces in different shapes. While the Hindu leadership at Diamond Harbour resolved to go the streets to protest against rampant Muslim appeasement in West Bengal by the ruling Trinmool Congress Govt, fatal consequences of Love Jihad and for a real consolidation of Hindu Votes , the Hindu resolution at Dhanbad affirmed an exclusion of pseudo "Secular" stature in Bhartiya (Indian) Constitution and the Christian Conversion Conspiracy in Eastern India. Swami AgamanandaJi (Senior Saint in Bengal), Shri Radhakrishna Pradhan (Ex-Teacher, Bharat Sevashram SanghaShri Yogesh Saxena (Renowned Advocate of Allahabad High Court), Shri Amaresh Mukhopadhyay (Renowned Hindu Thinker), Shri Ananda Kumar Arya (Chief, Arya Pratinidhi Sabha, Bengal), Acharya Yogesh Shastri (Arya Veer Dal) Shri Chittaranjal Sural (Hindu Janajagruti Samiti), Shri Gopal Saha (Nationalist Lawyer Forum), Shri Subhas Chakroborty (Nikhil Banga Nagarik Sangha), Shri Tapan Biswas (Hindu Help Group) and Manas Saha (President, Jana Jagran Manch) were present in the Diamond Harbour Programme of Jana Jagran Manch. Swami PradiptanandaJi (In-Charge, Bharat Sevashram Sangha, Beldanga Branch), Shri Tapan Ghosh (President, Hindu Samhati), Shri Pradip Khemka (Sanatan Sanastha) and Shri Rajmangal Singh (Tarun Hindu Dal) were present in the Dhanbad programme of Tarun Hindu Dal. It is reported that 7000 people signed in a petition at Dhanbad to turned down the constitutional amendment of 1976 to include an unnecessary term of 'Secularism' in Indian Constitution only to deprive and humiliate Hindus in their exclusive rights in Bharat. 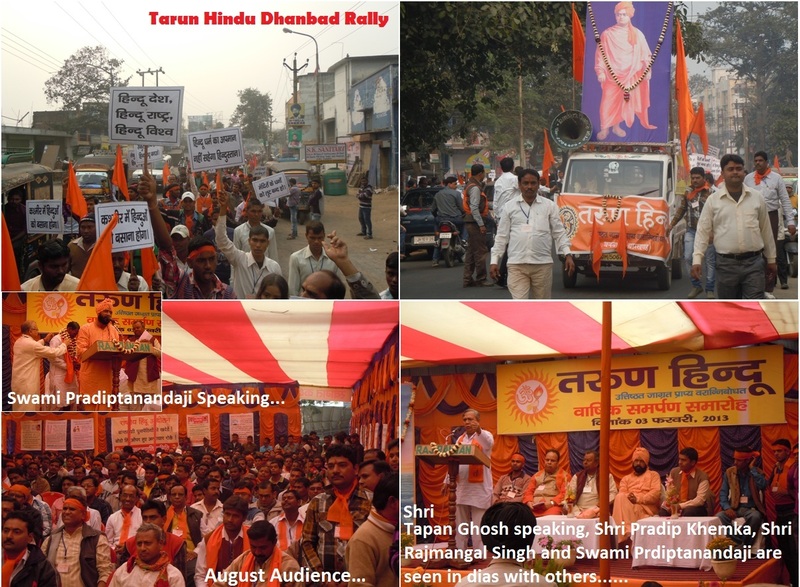 A big rally of 1500 persons was the main attraction of Dhanbad Hindu Sammelan. Swami Pradiptanandaji of Bharat Sevashram Sangha reconverted Shri Sidhu Lal, a tribal Christian and other 12 members of his family again through Suddhi Yajna. The meeting was converted to a mammoth rally. There were hundreds of people in the rally. The rally carried many placards demanding repealing the word "secular" from our constitution, ban on cow slaughter, ban on religious conversions etc. A memorandum was signed by thousands of people in the roadside requesting the president of India to repeal the word "secular" from the constitution of Bharat. A Hindu Sangharsh Samiti was constituted in the conference, taking many organizations together, to fight for the causes of the Hindutva. In Diamond Harbour "Jana Sachetanata Shivir ( Public Awareness Generation Camp)", homage paid to the Martyrs of Hindutva, specially in Bengal and announced a big rally of 10,000 Hindus in next phase to regenerate a Hindu Wave to consolidate a Hindu Vote Bank in the ensuing election. In this conference, Shri Tapan Biswas clarified the necessity of making a Hindu Help Group to help the persecuted Hindus in an increasing Islamic atmosphere in Bengal. Shri Chittaranjan Sural (HJS) and Shri Pradip Khemka (SS) advocated the Dhrama Jagaran and balance of Brahma Tej and Khastra Tej in making a Hindu Rashtra as a solution of all problems in present India in Diamond Harbour and Dhandad programme respectively. Shri Radhakrishna Pradhan and Shri Rajmangal Singh presided over the Sammelans (conferences) at Diamond Harbour and Dhanbad respectively. Dr. Nila Madhav Das (Chief of Tarun Hindu Dal) and Upananda Brahmachari (Editor, Hindu Existence) were the instrumental of inspirational sources of both the programmes to regenerate the Hindu Power in Eastern Bharat to ensure the real empowerment of Hindus in this region through a re-establishment of Hindu Rashtra in Bharat. FHRS does not share the opinions posted by group members. FHRS fosters academic career development for young intellectuals. Hindu terrorism - By Francois Gautier...!!!! What defines a true leader?